Welcome to the McLean lab (Slime Gang) website. We are microbiologists who are interested in studying the biology of bacteria as they normally occur in nature. Typically, bacteria are present as mixed (polymicrobial) populations that are attached to surfaces as biofilm communities. 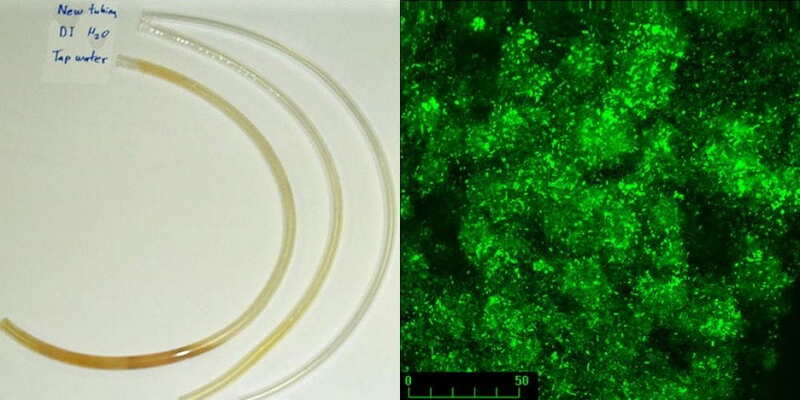 The picture on the left shows a biofilm forming within flexible Tygon tubing that is attached to water taps in the lab. Notice the increased discoloration due to biofilm formation on tubing connected to tap water, when compared to tubing connected with deionized water (DI H2O) and the new tubing that has not been exposed to lab water. The picture on the right taken with a confocal microscope, shows a magnified picture of a biofilm, isolated from a sink drain. In many biofilms, individual bacteria (green-fluorescing in this picture) will clump together in microcolonies and will be surrounded by regions with few bacteria (dark regions in this image that are referred to as water-channels). I invite you to use the links on this website to explore about the research and people in our lab. Comments on the contents of this site should be directed to Robert J C McLean.